Kate Terry’s practice encompasses sculpture, installation and drawing, exploring the relationships between points, lines angles, and forms from their defining conditions. Echoing the sloping walls and geometric forms within the fabric of our building, and drawing on references to the regularity of Minimalism, these site-specific installations respond directly to the architecture of the spaces they inhabit. Indeed for the first time the Louise H. McCagg staircase, a prominent Zaha Hadid design feature, has been activated and installed with artwork, serving to both highlight and interpret the space itself. Employing everyday materials with economy and restraint, intricate geometric patterns emerge amid hundreds of taut, straight lines which intersect and create new architectures within the gallery space—shapes which themselves might suggest awnings or smaller spaces to explore. Color—and ideas of the preexisting associations that the viewer may link to certain colors—is also a particular interest, explored through the use of bright, fluorescent threads that, while on the spool appear intense, but become subtle and almost disappear when stretched out. As it becomes unclear where the installation begins and ends, the viewer’s perception of depth, and of the shapes and structures in space, is disrupted, and we are encouraged to engage differently with the interior space that surrounds us. Connectivity and symmetry are embedded into the constituent relations in Kate Terry’s Series VII no1. The hexagon sculpture extends into the space – it is meticulously constructed and precisely situated. The use of utilitarian materials allows a sense of economy and restraint to permeate the approach. It is important for Terry that the work operates somewhere between drawing and sculpture. This relationship is developed by the use of coloured thread, tautly pulled in a parabolic curve, to give an illusion of recessive space. The connection and presence of the matt painted wooden hexagon (Farrow and Ball St Giles Blue) creates flatness, but also an illusory sense of weight, with a direct emphasis on physicality. Terry’s instinct for the installation derives from her studio practice where she makes models, draws and imagines the gallery space. She always starts by hammering pins into the gallery, evenly spaced and treated identically. This approach activates the system, but is also aligned to a synthesis of colour, interlocking geometry, and an underlying sense of visual discovery. Kate Terry is likewise concerned with altering our perceptions by throwing lines through space. In her work, though, they are not projected onto walls. She uses coloured threads, and makes them travel through a given interior in ethereal veils which challenge visual understanding at every turn. Spurning the possibility of using wire-a material she regards as far too heroic-Terry likes the everyday and do-it-yourself quality of her favoured material. She also delights in responding to the given character if an architectural space and how people use it. Her work is site-specific rather than dreamed up in the studio. Rejecting any thought of formulae, Terry is never able to decide on colours until the last minute, but she prefers paler hues to darker ones. The more her work approaches a state of invisibility, the better she likes it. Walking round her installations, where taut line subtly approaches the conditions of sculpture, we feel that it is both there and not there. It makes the space neither full nor empty, and its undoubted fragility is matched by a rigorous spirit of resilience. 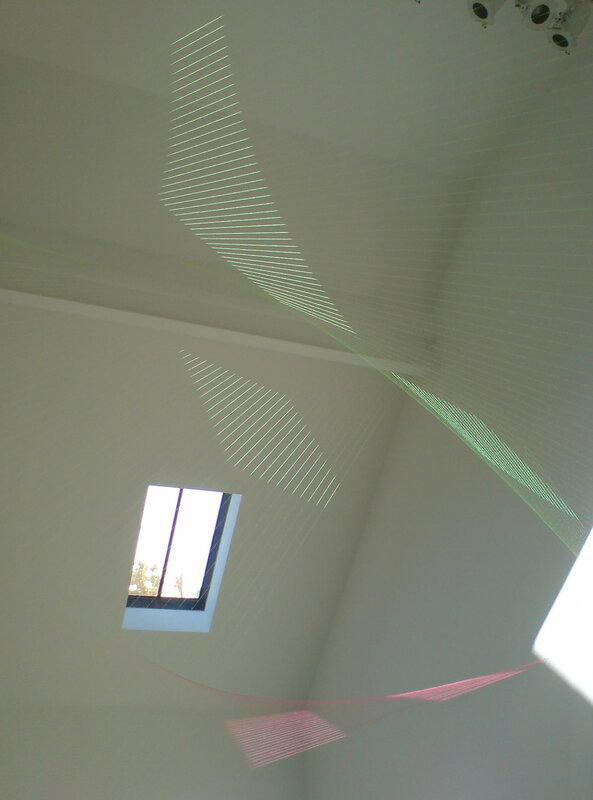 Kate Terry’s Thread Installation 8 (2008) bisects a high-ceilinged smaller gallery, comprising long lengths of green and pink cotton tacked in carefully plotted lines to create barely visible vectors. The classically minimalist effect of these slight means is rather like an Anthony McCall projection done by Fred Sandback, though the brashly DayGlo threads avoid straightforward homage. Spare crosshatching is echoed in another peripheral room by the looming shadows cast by Shawcross’s Slow Arc Inside a Cube (2007) in which a cruel-looking motorised mechanism circles silently within a black cage, a bright bulb at its tip describing a diagonal line between two corners. The light throws a looming shadow onto every surface of the room, projecting the cage’s grid onto every surface. Air, light and perception are also essential elements in Kate Terry’s sculptures, with their “linearity and almost imperceptible evanescence”. Her Thread Installations are complex and skilled, requiring not only patience but geometrical precision. Both subtle and beautiful, the work begins life as ordinary steel dressmakers’ pins and polyester sewing thread on spools. “I like the thread because of its everydayness… it’s not a spectacular material, both the coloured thread and the pins have a humble economy about them”. The thread’s properties enable her installations to be elusive or suddenly spring into our line of sight with an intense vibrancy, as the straight lines appear to bend, cross each other and mysteriously collect areas of colour. Each stage is essential; she maps the space, noting where the light gathers or the structural tension, in this case the steel bars criss-crossing the ceiling. She then ties each thread to a steel pin, leaving the end hanging to emphasise the handmade, and runs it across the space. The viewer can literally be “inside the sculpture” or suddenly be unexpectedly confronted. Variously “ethereal veils” or “hard-edged minimal drawings in space”, the threads travel through the air in a “field of visual interference”. It brings to mind both the fragility of nature and its robustness, its “phenomenological optical illusions” and atmospheric effects; how a beam of sunlight can illuminate specks of oscillating dust which a moment before had been invisible, or highlight a spider’s web. Terry’s “truth to materials” is vital to her contemporary minimalism. Finally, when she dismantles the installation the threads’ tension deflates and she is left with tangled ball of colour caught on the pins, a poignant metaphor for how air can lift, suspend and then release. Jean Wainwright, Air I Breathe exhibition catalogue, Gazelli Art House, at Rochelle School, London, 2011. Time Out Exhibition of the Week. Kate Terry’s thread manifestations; pinned delicately between walls, employ the familiar Minimalist trick of creating the appearance of volume through the slightest means. Two red, kite-like forms twist one over the other to create a cage of sculptural suture that seems taut enough to defy logic and pass through flesh like cheese wire. Rarely has the suggestion of space felt so claustrophobic. The formal perfection of the piece throws the architecture of the gallery into sharp relief: the structural anomalies of the site become all the more apparent as your eye attempts to follow the journey of each optically charged line from start to finish. The crumbly, decrepit ceiling (from certain angles blushed pink through multiple threads) appears to be hovering slightly embarrassed above the space – as though the whitewashed box below has been allocated the wrong lid. Rebecca Geldard, “Kate Terry: Exhibition of the Week”, Time Out magazine, August 8-14, 2007, No. 1929. Similar to Papes work is the approach of the Canadian artist Kate Terry. Floating structures in very different interiors, formally reminiscent of computer-generated string art and spirographs, are applied using the finest colored yarns. Due to the fact that the threads converge, cross over and then run off again, different density ratios arise. With this formal method, the artist can also create curves, giving the impression of movement and volatility. The softness of the material and the incidence of light, as with Pape, ensure that the objects disappear into nothingness. In these installations, one could speak of para-objects or para-architectures, because the solid, permanent and limiting is at the same time the fluid, the energetic, the transparent and the delimiting. With formality, Kate Terry leads the visitor into a space of small sensations, into a space of touch, suggestion and interference. Gunnar Schmidt, professor for Intermedia Design at the Trier University, archithese magazine, International thematic review for architecture , Mai/Juni 3 2013, Switzerland, 2013. 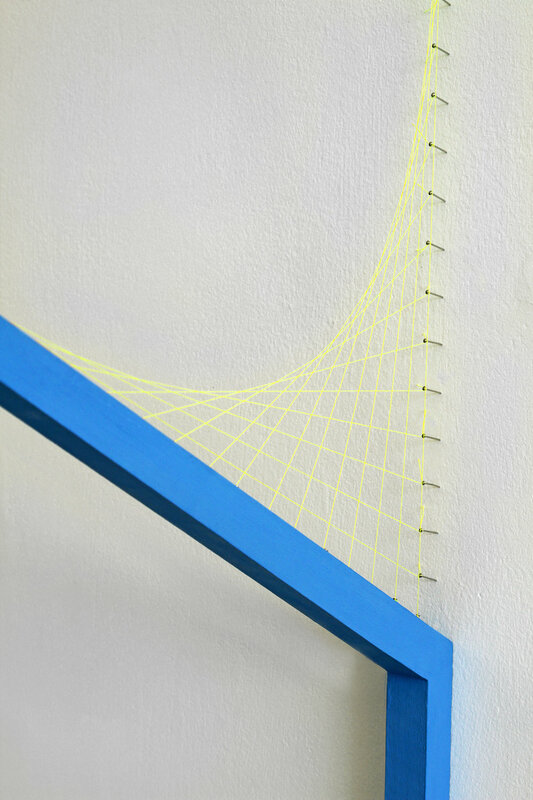 Terry’s thread installations have taken the confounding craft of string art (at times exalted with the name ‘symmography’) and expanded it into colorful articulations of gallery spaces. Traditionally (if one can apply such a determinant to a practice springing from the bourgeoning craft zeitgeist of the 60s and 70s) string art involves the creation of an image on a board using nails and string or fine metal wire. The perimeter of the image is denoted by tiny nails hammered in at measured distances, the volume between them described by lengths of string carefully threaded between each nail, crisscrossed and twisted to form regular striations of pattern. Owls, ships, mushrooms and sunsets are popular subjects. In Terry’s hand the demented cult of symmography has been both amplified and reduced. Terry has chosen the flimsiest of materials for her works—using straight pins and sewing thread in tasty colours, but installed them on a grand scale. In Thread Installation #9, the third element of the Pinpoint exhibition, Kate Terry has visually described the gallery space using one of her lapidary thread installations, carefully articulating both the hard edges and slight idiosyncrasies of the room’s construction and design. Hammering in pins, she has then tautly tied lengths of pink thread between the miniature stanchions, creating breathtaking arcs that shouldn’t impress, but do—they are just so gosh-darned lovely and precise. 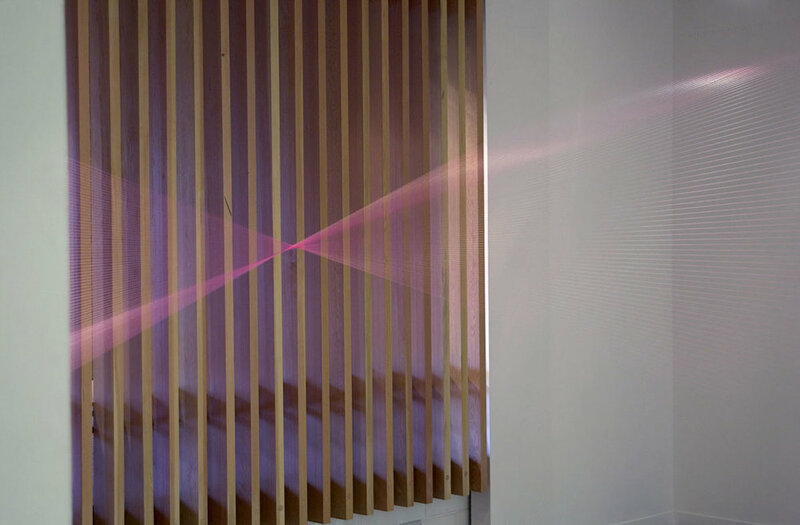 The colour of the threads of the installation is also associated with the feminine: this purplish pink is almost too pink. At least for a decisively Post-Minimalist piece. It is in this gap that the pertinence of the piece resides. It is “off to one side,” simultaneously respecting and departing from Minimalist rules. The artist explains in her writings that she is interested in geometry and in series, in straight, clean lines, in the precision of the form, which correspond with the rules of Minimalism and its fascination with industrial forms. Terry’s two almost intangible drawings in space unfurl along seemingly mathematical graphic curves which become three-dimensional. Pascale Beaudet, Diaphanous catalogue, Skol Centre des Arts Actuels, Montreal, 2002. Kate Terry strives for perfection. Meticulously, delicately, and with great restraint she skilfully alters gallery spaces and the way viewers experience them. And yet the work she eventually completes is, at first, almost invisible. She works extremely hard to create an installation that reveals itself slowly — transforming imperceptibility into spectacle. With coloured thread, tautly pulled across the expanse of the gallery, Terry creates a subtle yet large presence: a whole form articulated through the most minimal means.1 This is her challenge. In her studio she makes a model; she draws; she imagines. In the gallery, Terry starts by hammering pins into the gallery walls. Here, her search for perfection begins. She is adamant that the pins are absolutely evenly spaced and treated identically. She ties a thread to each pin on one wall and stretches it towards its designated pin on the other side. She ties the end. The threads travel across, above, and beneath each other. Georgiana Uhlyarik, exhibition catalogue of Interference at Mercer Union, Toronto, 2006. Georgiana Uhlyarik is Curator of Canadian Art at the AGO, Toronto.